The other day I loaded up my car with 2 desktop computers, 1 laptop, 1 CRT monitor, a random RF converter, an assortment of cables, keyboards, and mice, 3 cans of paint, 1 can of paint thinner, and 1 half-full bottle of anti-freeze. I was headed to the Hamilton County Computer Recycling Drop-Off to drop off all the old electronics, and then to the Household Hazardous Waste Collection drop-off to drop off the paint and other assorted poisons. Whenever I see a big CRT monitor in a trash can, I always frown a little bit. 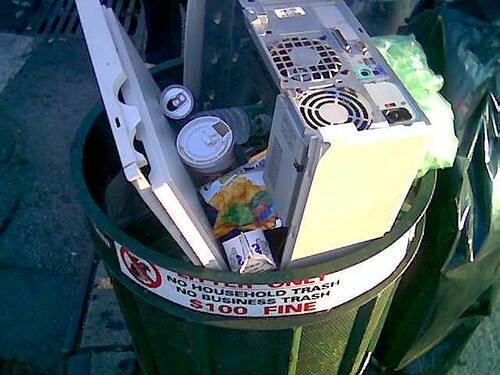 If I were to dump a big monitor in the curbside trash, it just wouldn't feel right. A big block of metal, glass, PCB, and chemicals taking up all this space. And you can't flatten it like paper or cardboard. I guess that's just me.